It is hard to believe that it was only eight years ago that Steve Jobs introduced the iPhone in his famous speech. The revolution that seems to be changing everything is of course rapidly changing audio usage as well. It seems that almost anywhere one goes one will see someone with earbuds on; tuned out from the world. Edison’s “Share of Ear (SM)” study allows us to understand just what kind of audio is being consumed. 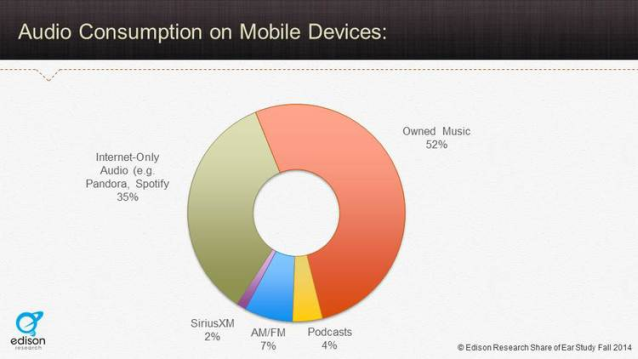 The graph below shows what platform of audio is being consumed on mobile devices (which would also include tablets or iPods/MP3 players). It’s important to note that this is the platform of audio — listening to AM/FM means listening to AM/FM content via streams or ‘over-the-air’. It makes a certain amount of sense that ‘owned music’ would be the biggest portion of audio consumption on mobile devices. Streaming pure-plays like Pandora and Spotify, which are in so many ways ‘built’ for mobile, account for over one-third of all audio consumption on mobile. Thanks, Larry. More excellent research from Edison. This may be a glass half full view of the results for broadcast radio, but the fact that AM/FM currently represents 7% of mobile audio consumption suggests a huge untapped opportunity to me. It’s been 40+ years since people listened to radio on transistor radios, nearly 30 years since they listened on Walkmans or boom boxes. But, now MORE than ever before, people have an AM/FM radio in their pocket. And yet broadcast radio is doing next to nothing to promote listening on mobile. The AC format hit the big time with its “Listen at Work” campaigns starting back in the 80s. Today, I would venture that nearly every format — but especially news, talk and personality radio — could benefit from being promoted as your first choice for audio on your smartphone.